It’s a strange world that we live in and in the world of Styx it was even weirder. AOR Magazine managed to speak with three of the band for this feature, and found it heart-warming to wallow in the respect and admiration all of them have for each other’s contributions to their music, even after many years of acrimony. That’s not to say all is sweetness and light in the Styx camp but what is interesting is that, in the cold light of day, they all acknowledge that the sum of their parts made a truly great noise; a band where everyone played a positive part. Yes, it’s hard to believe that a band with so much success can so quickly become so unglued. For now, however, let’s ignore the finger-pointing and get stuck into a little prehistory – a recapitulation, if you will, of the early (but not necessarily dark) days. You can trace the formation of Styx back to the early 1960s and its rhythm section, brothers Chuck (bass) and John (drums, who sadly died in 1996) Panozzo, two mad-keen music fans from the Chicago suburbs who started a garage band called The Tradewinds. With the addition of keyboardist Dennis DeYoung, they subsequently switched moniker to the more streamlined TW4, and later that decade added guitarists John Curulewski and James ‘JY’ Young. Building a reputation as a hot live band, they signed to local Chicago label, Wooden Nickel Records, partly owned by renowned media mogul and concert promoter Jerry Weintraub. The label insisted on a new name and, following exhaustive discussion, they refashioned themselves as Styx, chosen only because none of them hated it. In total they recorded four albums for Wooden Nickel, all broadly progressive rock with elements of hard rock and a few sappy ballads thrown in for good measure. Indeed, as a precursor to later recordings, 1973’s The Serpent Is Rising was thought to be vaguely conceptual, hinting at a style they would bring fully into focus further down the line. Incredibly, however, two years after its original release in 1973, the album Styx II featured a track titled Lady, which emerged as a regional and then national hit single, reaching the dizzy heights of No.6 on the Billboard chart. It was this success after years of struggle that finally prompted the band to look for a more influential record label. Wooden Nickel was awash with problems; not least of all restrictive studio budgets and, perhaps most damning, a management clause in the contract. Despite an attempt by RCA (Wooden Nickel’s distribution company) to then secure the band’s signature, it was growing independent label A&M that eventually signed them. It was also A&M who introduced them to their new manager, Derek Sutton, an Englishman who had previously worked with a number of quality acts, including Robin Trower. With a new label, money and freedom they set about recording Equinox, an album that would herald a more focussed and perhaps more commercial approach. Issued in 1975, and engineered by long term studio cohort Barry Mraz, the album was heralded as a fine statement of intent. It was also housed in one of the most striking album sleeves of the period: a flaming block of ice set in a surreal beach scene underneath an angry green sky. 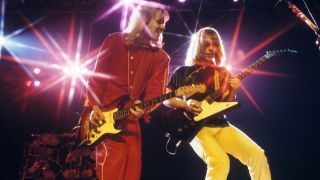 This unique image somehow identified a few key elements of the emerging Styx sound, suggesting JY’s aspirations as a hard rocker (which later became his brand identity), ably demonstrated by the taut guitar riff of Midnight Ride, along with Dennis DeYoung’s adventurous prog rock ambitions, best exemplified by Suite Madame Blue and Lonely Child, a deceptive combination of ballad and brawn. To cap it all, the band scored another Top 30 US hit with Lorelei. But while they had everything to play for and nothing to lose, they suffered a setback when guitarist John Curulewski (who sadly passed away from a brain aneurysm in 1988) left the band almost immediately after the recording sessions, on the eve of an impending tour. The hunt was on to find a suitable replacement; not an easy job considering the demanding skill set required, and the fact that a tour was looming. Fortunately, Styx soon found their man in Tommy Shaw, a seasoned but previously unknown guitarist/songwriter who had played in a local Chicago band with the unlikely handle of MSFunk. Although they recognised Tommy as a great guitarist/ vocalist and a dynamic performer, they weren’t aware of his song writing ability. But once this became apparent, the rest of the band felt like they had won the lottery. Debuting on 1976’s wonderfully crafted Crystal Ball album, Tommy’s impact was felt immediately, having penned the title track and contributed to several other key moments. The album remains one of Styx’s most impressive statements, picking up the pomp rock baton from Equinox and crafting an even more concise and flamboyant opus. At the heart of the process was their ability to fuse traditional British progressive rock with all-singing, all-dancing American razzle-dazzle. Again, JY was let loose, with the taut, straight-to-the-point shock rock of Nu Shooz, while Clair de Lune/Ballerina showcased Dennis DeYoung’s burgeoning theatricality and was, for many, the high water mark of the album. Tommy Shaw, meanwhile, scored a big coup: not only did he co-write and sing lead vocal on Mademoiselle, the album’s lead single, but it also became the album’s only hit, cementing his position in Styx. Behind the scenes, however, Dennis DeYoung was – even at this early juncture – feeling the pressures of being part of an in-demand rock band. He began to feel that his life – and to a degree his destiny – was being ruled by Styx, and not the other way around. This wave of despondency would last for some time, but would also go on to fuel some of his, and the band’s, greatest work, their next two albums, starting with 1977’s The Grand Illusion. And it wasn’t just Dennis who was feeling a sense of unease with new found fame and wealth. Recorded once again in Chicago at Paragon Studios, with Barry Mraz engineering, The Grand Illusion was a masterpiece of pomposity. It was, to that point, the culmination of Styx’s entire career, a record shoe-horned full of songs that have stood the test of time, propelling the band into the superstar league. Indeed, to this day fans feverishly debate whether The Grand Illusion or Pieces Of Eight is the group’s superior release, a topic dividing them into roughly equal constituencies. Of course, such petty squabbling misses the point that we have two great works to enjoy, both of which being the finest examples of what pomp rock has allowed us sinners to enjoy. Themed certainly, but not truly a concept album, The Grand Illusion was informed by Dennis’s aforementioned concerns about life in the fast lane and all the pressure that was bearing down on him. He was not alone either. Other members of the band were also noticing unwelcome demands with fame and fortune. Classic songs such as Come Sail Away, Castle Walls and the title track revealed the group absorbed in self-doubt over what they were experiencing. Even mad axeman JY chipped in with a fine slice of acerbic observation in the riff-hungry Miss America, a song that shakes a firm fist at the shallowness of consumerism. The problem with making a record as strong as The Grand Illusion is that you are immediately forced into a position of having to serve up something slightly better next time around. That’s a tall order and one that many acts have failed to achieve. For Styx, working under a cloud of constant duress, it was no different. With their shared experiences and similar thoughts in mind, they commenced writing new material only to later find that the songs were thematically linked. Over the years it has wrongly been stated that Pieces Of Eight is an actual full-bodied concept album but that is not true. All members of the band deny the accusation but they do agree that the essence is uniform, isolation, disappointment, frustration, mistrust and duplicity being at the forefront of their emotions. Tommy: “We were still in the golden moment of time where we were in a band together, travelling together, playing together… y’know, paying our dues. We went from struggling to keep our heads above water, to reaching the point where some of the things that start to whittle away at bands appeared. At this point though, none of that stuff had taken seed. Then we had The Grand Illusion, which was a huge success, and we were just coming off the back of that, so we still had that little golden moment, going into the creation of the follow-up album. “The success of The Grand Illusion was still reverberating and, in fact, increasing as we started recording Pieces Of Eight. Naturally you look at your previous work and think: ‘Why did that work so well?’ And then you try to go down that road again. You can’t help but do that, but of course it’s better to start afresh. To be suddenly recognised and respected was fantastic, so we were all feeling very creative at that point. Pieces Of Eight was an immediate success, achieving triple-platinum sales and placing the band at the center of a media scrum that few hard rock bands – especially progressive hard rock bands – have ever experienced. While the public lapped up the records and bought concert tickets in their hundreds of thousands, highbrow critics berated the band, pouring scorn on their achievements and penning reviews that completely missed the point. Rolling Stone magazine in particular had been particularly contemptuous, and so manager Derek Sutton cut off all communication with the rock press, a move the band later came to regret. Pieces Of Eight refined the group’s sound and – although it was not apparent at the time – would be their last record to coalesce like a classic Styx album. Let’s not beat around the bush here, if you are looking for that chocolate-box selection of great Styx sounds, then this is their final great pomp rock moment, before the likes of Babe, Boat On The River and Mr Roboto radically shif the goal posts. Recorded once again in Chicago, with the illustrious Barry Mraz promoted to the grand title of Production Assistant, the record opens with the rollicking Great White Hope, another classic JY rocker that sets the thematic tone for the rest of the album. I’m OK, penned by DeYoung, is a stark confessional, neatly summarising his on-and-off bouts of self-doubt and disillusion during the preceding years. “Actually it’s a co-write with James, but it was predominantly my song,” Dennis says. “So many times I write songs to remind myself what I should be thinking when I’m certainly not. I went through a very difficult period in 1976, 1977 and parts of 1978 where I suffered from depression and anxiety. This song was really me trying to remind myself that I was fine. It wasn’t meant to be some sort of pop psychology ‘oh, good for me’ type thing. It was actually coming from a much darker place. In retrospect I was probably trying to act like my own cheerleader. “My daughter’s name is Hannah,” says Tommy. “She’s always being asked: ‘Did your father write that song about you?’ But she’s 26 and that song was written in 1978 – you do the math! The original name of the girl in the song was Anna, until Dennis’ keyboard-tech’s daughter came to a show. Her name was Hannah and I figured that that sounded better than Anna, so I changed it. The Dennis DeYoung-penned Lords Of The Ring has nothing whatsoever to do with JRR Tolkien but is, once again, an acerbic observation on the cult of stardom, a nod to the fact that self-aggrandising rock musicians are like modern-day pied pipers. It was also a personal allegory, comparing his quest for fame and fortune and then realising that he was still dealing with the same issues. Side two features a brace of quintessential Styx classics, opening with Blue Collar Man, a Tommy Shaw hard rock nugget featuring Dennis DeYoung on very angry Hammond organ, and lyrics that pay homage to the working man. Renegade, written by Tommy Shaw, is arguably the icing on the cake, with spine-tingling lyrics, a spooky vibe and one of the best guitar riffs of all time. Of course it all pivots on a brilliantly pompous tempo, while the middle eight features some of the band’s finest harmonies. Listen out, too, for a killer JY lead guitar solo and Tommy’s truly monster vocal performance. No wonder this song reached the US Top 20 with ease. Tommy: “It started out as a dirge, three-part harmonies, and very slow, so we kicked up the energy and suddenly everything changed and all the goodness of the song came through. That’s the funny thing about working with the band back then – it was just about making the song the best we could. “Here’s another interesting story,” adds Dennis. “Blue Collar Man comes out and does well, and then the label decides to release Sing For The Day, and on the b-side was Renegade. We were on tour, and whenever we played Renegade, our drummer John would stop in the middle of the song and get the entire audience to scream ‘Toga! Toga!’ – like in the movie Animal House. It was so dynamic live that when the Sing For The Day single came out, the radio programmers flipped it to listen to Renegade. Not the record company and not the geniuses in the band. That’s how Renegade became the second hit. The penultimate song on the album is the title track, which is another Dennis DeYoung confessional. But wait, there is a final sign off: an instrumental titled Aku-Aku, composed by Shaw, providing a neat and serene conclusion to the album. Named after a somewhat controversial book, titled Aku-Aku: The Secret Of Easter Island written by Norwegian archaeological explorer Thor Heyerdahl in 1958, the piece provides a contemplative, dare we say, progressive conclusion. “Back then, we loved the production values achieved by Alan Parsons,” admits Tommy. “Real headphone-friendly stuff, like an aural trip through the stereo spectrum. Aku-Aku has that dreamy quality to it, y’kno… fading off into the sunset. The Pieces Of Eight album artwork, a fantasy image created by Hipgnosis, depicts older, finely chiselled female models, set against the Easter Island landscape, wearing miniature stone monuments as earrings. The entire band now agree that, despite early reservations, it’s an iconic image. Intriguingly, such was Styx’s huge popularity, the album was originally issued without the band name or album title, a feat only matched by Led Zeppelin for sheer audacity. What of the notion that Pieces Of Eight was the last great Styx album? “I wouldn’t disagree with that,” opines Dennis, with a surprisingly agreeable tone. “I understand that position. We developed a style, had success with it, and when you do that, the audience fully commits to what you told them that they should like. Not surprisingly they might be reluctant to accept any changes. I thought The Beatles had gone mad when they released Rubber Soul, and then I realised that it wasn’t madness, so I had to figure out whether I wanted to go with them or not. We made the same sort of change. Cornerstone was a change, no doubt about it. It wasn’t Rubber Soul [chuckles] – and I understand why it was met with doubts. “It was the end of our innocence,” laments Tommy. “We were all drinking from the same cup, and sharing the same musical thoughts. It was also the first time that things shifted a little bit. Up until then I had been the new guy, but Blue Collar Man and Renegade had emerged as big radio rock tracks and I was getting a lot of attention. It was an adjustment for everybody, not least of all for me. Pieces Of Eight sold three million copies but it also signalled the end of an era. Sure, the band would go on to have bigger hits and achieve even more album sales. But the fact remains that this was a record that would never be topped stylistically. Indeed, the band’s next move would be to record Dennis DeYoung’s sentimental Babe, a song that was never even meant to be a Styx track, but propelled them into a new stratosphere of success. With the benefit of 35 years of hindsight, how do the group feel about Pieces Of Eight? “When I listen to Pieces Of Eight now, I think that it’s really a lovely piece of work for that particular time, but overall I was very disappointed with my contributions as a writer,” says Dennis, with total honesty. “I had felt that, after eight albums fooling around with what I would call the Americanisation of English progressive rock – with a sugar-coating of hard rock and pop – we were treading the same ground. We were never an easily definable band. You might not believe it to look at them, but Styx were born for adventure, women, whiskey and sin. I know this to be true because I saw them live in El Paso in the late 70s. I can’t put my finger on the exact date, but I remember the occasion most vividly. The show took place in a festering Texas concert hall full of crazy natives from south of the border down Mexico way. Despite being an indoor venue, these stoned sombrero’d muchachos (y muchachas) were intent on igniting bonfires all over the shop; thus the atmosphere was tainted – some might say augmented – by clouds of acrid smoke. Oh, not to mention the occasional crackle of gunfire. Despite the kerfuffle, Styx rose to the occasion manfully, delivering a performance of such radiance, resplendence and mind-expanding magnificence that only one phrase could be invented to illustrate it – ‘pomp rock’. There were no hills to run to in El Paso, so the mixing desk had to suffice. From my vantage point next to the band’s gleaming, hi-tech soundboard, in the midst of the seething, poncho-wearing throng, it was interesting to note that Styx did not, in fact, have a frontman. They had three! There was tousle-haired blond pretty-boy Tommy Shaw, wide-eyed, innocent and somewhat startled-looking, as endearing as a short-trousered schoolboy standing in the rain by the bus-stop cradling a Transformers lunchbox. There was the unfeasibly tall and surprisingly camp James ‘JY’ Young, whose every fey, purse-lipped pout was saluted by showers of tequila and the crunch of several thousand stale taco shells being trampled underfoot. And finally there was my hero, Dennis DeYoung, a sort of pumped-up rock-star version of Andrew Lloyd Webber, but much more handsome and less goofy with his nice, neatly trimmed beard and lithe, baseball-shirted torso. The preening DDY cut a compelling figure with his overwrought theatrical gesticulations and shrill symphonic warbling. Frankly, he made the Phantom look like Norman Wisdom. The climax of the show arrived with Born For Adventure, a choice track from Styx’s tumultuous 1975 album, Equinox. DeYoung exited for a few moments during the song’s Motörheadesque intro (seriously, it’s a lot like Ace Of Spades) to re-emerge dressed as Zorro, complete with flowing superhero cape and brandishing a razor-sharp rapier. Looking back, it was a perfectly logical thing to do. The drama continued. Like a giant dirigible full of combustible hydrocarbon gas, Born For Adventure ascended rapidly into the Troposphere. As it began to infiltrate the Noctiluscent Cloudbase, one of Styx’s roadies leapt on stage to engage DeYoung in a deadly sword fight. A compelling game of gato y ratón (Mexican for ‘cat and mouse’) ensued before Dennis performed a deft, twinkle-toed, Fred Astaire-style side-shuffle, wrong footing his adversary. With a cackle of delight he skewered the roadie with his stiletto and the song ended in a pandemonium of guitar powerchords and suitably outlandish feedback. Was there ever a more flabbergasting sight than Styx live in America in the 1970s? No señor! Styx: So what happened next? There’s little doubt that matters changed for Styx following Pieces Of Eight. Their next album, Cornerstone, as previously mentioned, veered away from the pomp rock majesty of their earlier work and opened up a new pop sensibility that, for many long-time devotees, sounded alarm bells and heralded a new era for the band. Paradise Theater, their 10th album, returned to their thematic roots, with Dennis taking the creative reins, allowing them to design an impressive stage show around his concept. Musically, however, it was clear that they were never going to return to the same style of progressive pomp rock that had propelled them to success in the first place. By the time they recorded 1984’s Kilroy Was Here, the situation had almost taken a comedic turn for the worse with the electro-pop of single Mr Roboto, confusing their fanbase despite reaching No.2 on the charts. Undeterred, they instigated grand plans for an ambitious live show that opened with a specially shot movie. It was, unfortunately, a disaster; their audience began to desert them and album sales slowed to a crawl. Subsequently the band went on hiatus, not actually splitting up formally, but certainly not in a mood to reconvene any time soon. Solo albums were made and forgotten until, in 1989, a re-formation was instigated, sans Tommy Shaw who was committed to Damn Yankees, and replaced by Glen Burtnick. Styx not only recorded an album, Edge Of The Century, but also undertook a tour. Both were relatively successful ventures, the band experiencing a wave of popularity, but not to the degree of their heyday. In 1993 Dennis fell under the spell of the theatre, initially appearing as Pontius Pilate in a production of Jesus Christ Superstar, playing over 200 dates across the US followed by the recording of an album of Broadway standards. Just when all hope appeared to be lost, another reunion was instigated in 1995, this time with Tommy Shaw. The subsequent tour, dubbed Return To Paradise, was a major success and featured Todd Sucherman on drums depping for an ailing John Panozzo. However, matters were to take a further turn for the worse during the band’s next studio album Brave New World, when Dennis contracted a debilitating viral illness making him sensitive to light and forcing him to abandon the recordings. It was such a traumatic event that he was unable to commit to touring, forcing the remaining members of Styx to replace him with the flamboyant Canadian keyboard/singer Lawrence Gowan, a man who has unquestionably reinvigorated the band. When they toured Europe a couple of years ago (featuring ex-Babys man Ricky Phillips on bass; Chuck Panozzo battling the debilitating effects of Aids) with Journey and Foreigner, Styx absolutely stole the show with an electrifying performance. Dennis has all but recovered from his ailment these days, and continues to pursue a number of musical interests, including theatre, live work and recording (he is a major solo star in Canada, an early Styx strong post). Most surprisingly, he released an astonishingly accomplished rock album in 2007, titled One Hundred Years From Now, a record that took its influence from the classic Styx pomp rock sound. Sadly, Styx and Dennis are no longer in communication, making a reunion unlikely at this point in time. Both sides feel aggrieved with each other but, equally, they all obviously still have enormous respect for each other. One can only hope they’ll one day find resolution. This was originally published in AOR issue #10.